Britney Spears Is A Soccer Mom! Home » Britney Spears Is A Soccer Mom! Arriving some security and a blanket, Britney sat with some of the other parents at the side of the field. Her boys must be on different teams because she played with each one, while the other was on the field. 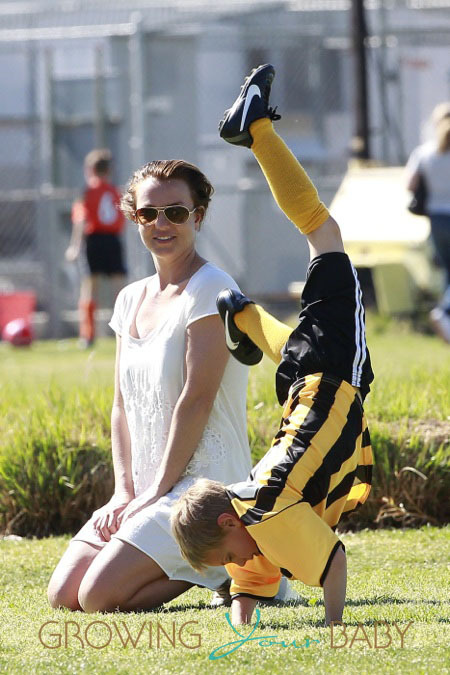 During his time off Jayden showed some of his gymnastics moves, doing handstands to impress his mom. Britney then showed him and another little girl who was playing with the pair how to do a back walkover. While at the practice, the singer changed her outfit. Arriving in sweat pants and a tee, she reportedly changed into a new outfit in a store. I like Britney but I think she is still a hot mess. Why doesn’t she have full custody of her boys? Someday she’ll look back and wish she had done more.